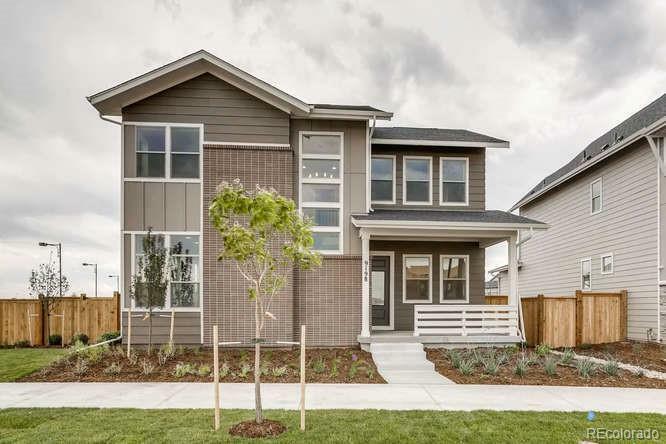 This beautiful home is the last AMP floorplan in Beeler Park Stapleton! This home has an inviting great room with a fireplace that opens to the gourmet kitchen with ample cabinetry & large island. The dining area opens to a patio and large landscaped backyard. Wood flooring throughout the first floor, including the study. The stair railing is stained wood. The upstairs features two guest rooms with a shared Jack & Jill bath. The master suite has a coffered ceiling, a master spa option with a frameless shower door & a large walk-in closet. This home has a finished basement with a living area, 4th bedroom, & full bath. 2,761 finished square feet, plus an unfinished storage area in the basement. Upgraded modern chic cool design with grey tones. Oversized 2.5 car garage. Zero Energy Construction, Energy Recovery Ventilators, tankless water heater, A/C, & Solar Power are included with this new construction home. Ready Oct/Nov 2018. Photos provided are of model home, not actual home.